The Trinidad Fundadores is a recent Habanos success, a medium-bodied Lonsdale, 7.6” (192mm) long, of 40 ring gauge, and comes in a 12 cigars box. The Trinidad Fundadores, originally restricted to diplomats and officials, is indeed one of Cuba’s finest smoke. • Elegant and perfectly rolled. Complex cigar with smooth flavors of wood, earth, coffee and plenty of spices. 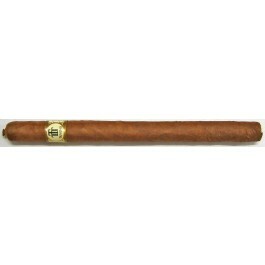 • Strong and powerful cigar, body between medium-full and full. This cigar is simply a must-try for every Cuban enthusiast. The cigar is looking good, with a rather refined appearance. Its long shape, its uniform creamy chocolate wrapper and the oil sheen on its surface are a delight to the eyes. To the touch, the Fundadores is smooth, it has minimal veining, and it is rolled and filled to the perfection, not overfilled, not underfilled. To top it all, the cap is beautiful and the seams are invisible. The cold aroma coming off the wrapper smells is sweet. There is mainly some cedar aroma, due to the extra sheets of cedar used as separators. There is also some spice characteristics. Once the cap is cut, the draw at cold is smooth and has some spicy flavors (black pepper), and also some dried fruits (black cherry), in addition to some woody aromas. Lighting up the cigar is effortless and the burn is excellent. Right away there is tons of smoke upon the first draw. The first flavors to reach the palate are of dark and intense flavors: leather and black coffee, mixed up with some vegetal character (dark tea), that marry beautifully with some toasted tobacco. In the background, there are some sweet notes of cookies and of fruits. There is also a good amount of black pepper, and some earthiness developing early on. The smoke is very aromatic and smooth. The draw remains smooth all along, while the burn doesn’t require any attention. A perfect construction. The dark and intense flavors present upon lighting up the cigar continue for some time. There is plenty of earth, wood and some grassy note as well. Around the middle of the first third, the flavors evolve; there are still some deep woodsy flavor, some wheat characteristics, dark coffee beans, and a tad of chocolate. The flavors are becoming more powerful at this point; the strength of the cigar is hovering around a full body. There is also a nice spicy aspect, with some pepper here and there. Overall, the cigar is smooth and the smoke is very creamy. It is a delight to inhale and exhale slowly this rich and thick smoke. Each draw releases huge billows of smoke. And to top it off, its aroma is beautiful: sweet and floral. Towards the middle third, the cigar mellows out, it is not as strong as the first third. This allows the flavors to become more subtle and allows for more complexity. The balance between the strength and the flavors is great; the flavors are increasingly creamy and smooth. There are plenty of sweet, musty notes, of cedar, leather, and some other vegetal flavors. There are also notes of oat, sweet vanilla and caramel, coffee and a nice amount of black pepper and spice. Overall, the cigar is still very smooth and creamy; the body is still oscillating between a medium-to-full and a full body. Each draw still releases a very thick smoke. In the final third, the cigar’s strength reverts to the level of the first third, a full body. The change is abrupt, sudden; it can catch you off guard. However, it is not unpleasant at all. The dominant flavors at this point are of earth, leather, and deep black coffee. There are also notes of oak, peppery spice, honey. Overall, the flavors are pretty salty, spicy and strong. The burn is still very good and even, the draw remains perfect until the nub. In summary, the Trinidad Fundadores is a cigar that every Cuban aficionado should have in his humidor as it one of the most refine cigar out of Cuba. It shows great complexity, spiciness, creaminess, strength in an elegant and flawless cigar.